These are the main messages in the book “The Lean Six Sigma Guide to Doing More with Less”, written by Mark O. George. Redefining Lean Six Sigma this way is not completely new, but the book gives a good helicopter view of the best practices today, and you will find many useful insights in it. Minuses are the strong focus on cost reduction and the somewhat confusing use of formulas in some chapters. Mark George responds extensively to our findings. Although Mark George is the main author of The Lean Six Sigma Guide to Doing More with Less, several colleagues added first hand experiences and knowledge. These people are mentioned at the beginning of each chapter. 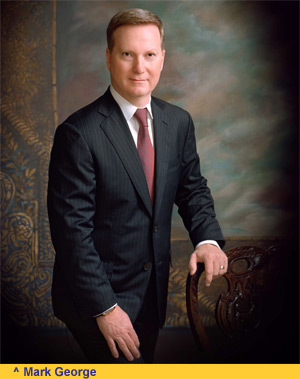 The book starts with a foreword written by Mark’s father, Michael L. George, former CEO and founder of George Group Consulting, which became part of Accenture three years ago. 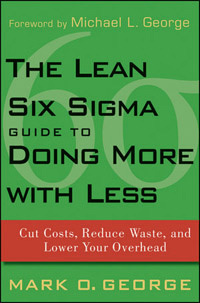 The book describes the way how George Group Consulting, now Accenture, thinks Lean Six Sigma should be applied. Many case-descriptions interwoven in the text emphasize this. Often you see phrases like “for one client, we…”. All real-life cases highlight the extensive experience of the authors concerning process improvement. However, they are unfortunately all short and anonymized. In my opinion, the book would have gained much in strength if a few specifically named cases had been chosen as leitmotiv. Lean Six Sigma arose from Six Sigma, as a broadening with the aim to include logistic aspects. On the management level the Six Sigma approach remained more or less unaltered, but in the Analyze and Improve Phase of the DMAIC-cycle also Lean-tools are applied, like Value Stream Mapping and the creation of market pull. This is also the line of approach in this new book. One example: Kaizens are described as mini-DMAIC projects to be finished by multidisciplinary groups in several weeks. Lean experts will certainly say that this is not true Lean, since Lean has the aim to create a lasting Kaizen-spirit, so that everybody will help to improve every day. Lean is experience-driven and more bottom-up initiated. When safe, there is even room for trail-and-error. In any case, people improve themselves, provoked and guided by their management. This has the advantage of high involvement. Six Sigma and Lean Six Sigma are data-driven and more top-down initiated. This has the advantage that all improvement initiatives can be tightly aligned with the business strategy. In addition, it often can be predicted what the (financial) result of improvement projects will be. In my opinion companies need to combine those two approaches, because they are equally important. Having said that, when you start with continuous improvement I think it is best to choose only one method first, be it Lean or Six Sigma (or TPM, or TOC, or QRM, although not mentioned in the book). Aspects of the other methods can then be added later. When you choose Six Sigma as point of departure, implementing the Lean Six Sigma variant brings the advantage that Lean thinking is already introduced from the start. Lean management aspects like going to the Gemba, A3 management and visual management usually are not included in Lean Six Sigma. These concepts are also not discussed in the book. However, a large consultancy firm like Accenture must have experience with Lean management. So it might well be that the authors of the book deliberately omitted it, to prevent throwing readers into confusion who are not familiar with process improvement. Additional information: Published by John Wiley & Sons, 327 pages (2010). +- There are many (short) case descriptions in the book, but these are unfortunately all anonymized (except one, namely Owens-Illinois). Only a business that thoroughly understands the sources of variability will be able to carry the right mix of reduced inventory levels. Overproduction is not limited to making products which are not needed (yet). If you hire for example third party lawyers when you have in-house attorneys this is also overproduction. Of course there are many more of those insights hidden in the book, these only serve to give you an impression. Waste should not only be reduced within functional units, but also across and between them. To achieve this, process oriented thinking is a prerequisite. To reduce complexity and improve quality on the one hand, and to eliminate process waste on the other, Six Sigma and Lean tools should be combined. As a shining example a hydraulic hose company is mentioned that applied Lean Six Sigma to increase its enterprise speed. By continuously focusing on reducing their overall lead time, they eventually gained a competitive advantage, because they could deliver faster and also in smaller amounts than their competitors. 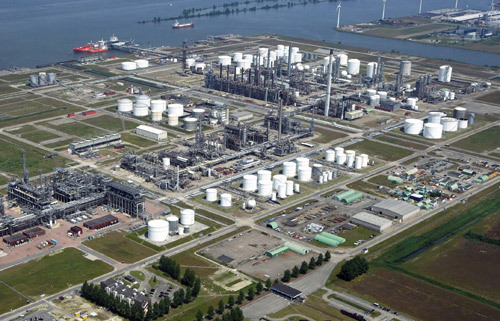 Although not mentioned in the book, Shell is very good example of a company that applies Lean Six Sigma in a proces-oriented way. The confusion starts with the next formula, the so-called Process Cycle Efficiency (PCE), or the percentage of value added activities relative to all activities. This formula gives the impression that a reduction of WIP directly leads to less wasteful activities, because the percentage of value added activities increases. It took me some time to find out why: the PCE-definition is time-based. If it had been defined as cost-based nothing would have changed! Of course I know that low WIP is often indirectly associated with less waste in the form of searching, material handling etcetera, and besides that short lead times could well bring a competitive advantage. If it is this indirect advantage of enterprise speed that the authors are aiming for, then I think that should have been explained more clearly. After the somewhat confusing formulas in the middle, several much more interesting chapters follow again, this time about applying Lean Six Sigma in a holistic way. I liked for example the chapter about combining value stream maps for different product groups, to find dependencies and unneeded complexity. Complexity Value Stream Mapping this is called, it is a technique to find waste in processes, for example as a consequence of too much variation in the product offerings, or as a consequence of badly designed (not modular) products. Trim off any variety that your customers do not value highly enough. Regarding change management the new term feedback feasibility is coined: how easy can your ‘audience’ communicate back about your plans, both logically and emotionally? Practitioners of (Lean) Six Sigma, more than practitioners of other improvement methods, often mention cost reduction as their primary goal. This might be traced back to the roots of Six Sigma. Within General Electric in the eighties, many Black Belt projects had the aim to reduce procurements costs. The preface of the book starts with the following sentence: “The global economic collapse of 2008-2009 is widely recognized as the most severe crisis of its type since the Great Depression”. By this, the tenor is set: This is a book written for managers who want to reduce costs to survive in the currently hostile economic climate! Most of the customers of Accenture are large companies. Many of the cases are therefore typical for multinationals and report huge savings, in the order of millions of dollars. However, there is also a chapter for companies who seek a way to rapidly implement Lean Six Sigma without the need to train many people at once. Companies such as Philips, Shell, Sara Lee, Unilever and Heineken (although the latter two use Total Productive Maintenance instead of Lean Six Sigma) apply most of the things discussed in the book, like focused improvement and deployment, Hoshin Kanri, process-oriented thinking, leadership development and change management, see the case studies on this website. Seen in that light applying Lean Six Sigma as described in this book is not new. However, many smaller companies may not be familiar with all best practices: Many Lean Six Sigma initiatives end up at their initiative fault, due to a lack of focus, process oriented thinking, involvement and feedback from bottom up. So, to conclude, this book presents a good helicopter view of how use Lean Six Sigma to get maximum results (and it also tells how not to use it!). Reading it is worthwhile for everyone involved in Lean Six Sigma initiatives, even for people working in multinationals, since they will certainly find weaknesses in their approach! Prime Value Chain Analysis to identify disparate projects across the enterprise that together aggregate toward enterprise speed. Complexity Value Stream Mapping that helps mitigate the crippling effect that a proliferation of service offerings and products can have on speed and agility. Patented Lean Analytics to pragmatically uncover the root causes of low velocity but also to identify which operational issues are impeding speed. Little’s Law to size the optimum amount of work in process (WIP) based on average completion rates to enable overall process velocity. The reviewer is correct that the concepts of speed and agility are not new; these can easily be traced to Ford’s plant at the River Rouge in Michigan when, nearly 100 years ago, Model-T’s were being literally transformed from raw iron ore into finished automobiles in a startling 33 hours (that’s actual, sequential hours on the clock!). This fanatical drive toward speed influenced all managerial and design decisions at Ford (this is a key insight). Once he reached a 33 hour manufacturing cycle time he was able to reduce the sales price from more than $2,000USD to much less than $1,000USD, and at the same time he could more then triple his net operating margin! Talk about a win-win situation enabled by Lean speed. However, as we all know Ford’s main downfall was manufacturing inflexibility. In terms of velocity Toyota clearly understood what Ford had accomplished, but they keenly recognized the need for added agility / flexibility and accomplished this with an array of operational and managerial methods that are well documented1. 1) (red.) In standing on the shoulders of Giants Eli Goldratt shows in a similar way how Ford’s ideas about increasing throughput are still of value today. Most organizations have absolutely no idea how many “things” are ever in process at any one time. This is certainly true for service companies and even at times in manufacturing. Little’s Law is elegantly simple: it helps us understand that unless we increase process speed (or completion rates) the act of injecting any more work into the pipeline will slow down everything. As we say in the book, the easiest way to accelerate a value chain is to begin by controlling the amount of work being introduced. This is far easier than trying to improve the completion rates. Of course you should ultimately do both. The Process Cycle Efficiency (PCE) is the relationship of value added time to total cycle time. A key point we try to make (in part by way of the formulas) is to present practical and pragmatic ways to convey the relationship of process speed to process cost. Most organizations try to reduce cost by improving the “value added” activities (the numerator in PCE) rather than seek out the drivers of slow process completion rates (the dominator in PCE). It is usually far easier to uncover the immense amount of waste which manifests itself as low process velocity. The formulas are meant to help readers understand that by focusing on the acceleration of processes, you automatically reduce waste and therefore the related cost. The converse is not true. A narrow focus solely on eliminating waste may not result in true enterprise speed. While “waiting time” is indeed one of the common forms of waste that Lean sets out to eliminate it is looked at by most organizations as waiting time at the local process level, not across the enterprise. Achieving true enterprise speed requires the alignment of disparate processes, functions and departments toward speed and agility. It should become the mindset, mission and cultural fabric that is exhibited through fully aligned practices, procedures, protocols, rewards and recognition. When searching for the optimal lot size, EOQ will essentially run up the lot quantity until equilibrium in terms of lot size and carrying costs is reached. When making this determination EOQ only considers one part in the total portfolio at a time. This is where EOQ takes its turn back toward antiquity, back in the days when firms had very few offerings served by shared processes. With EOQ, by increasing the lot size of one item, “#A” for example, you’ve increased the manufacturing cycle time not only for that item but also increased the “waiting time” before you can make your next item “#B”. This delay requires you to produce a larger than needed amount for “B” and all downstream items because you must produce a sufficient quantity to serve on-going demand until you can cycle through the product wheel and begin to make “#A” again. George: ‘I completely agree with the reviewer that value creation should be the higher goal. We see “Economic Profit” (or EP) as the ultimate beneficiary of LSS. It is just as much an enabler of growth and differentiation, than it is a method for margin optimization and improving return on invested capital. Capturing market share and delighting customers by providing products and services of the highest value-for-money and doing so with consistency and certainty of outcome we have found to be the ultimate objective of LSS.